Wales scrum-half Rhys Webb insists his only concern after returning to fitness is reclaiming his Ospreys place. Webb has not played since suffering a serious foot injury in a World Cup warm-up with Italy in September. The 27-year-old could feature for Ospreys against Munster in the Pro12 on Sunday but is not yet contemplating regaining his starting spot for Wales during the Six Nations. "My focus is on the Ospreys at the moment," Webb told BBC Sport Wales. "I need to earn my stripes there, get the jersey back off Brendon Leonard. "There's a lot of hard work to get that back and help the Ospreys climb up the table. "We want to get into the play-offs and qualify for the Champions Cup next season." The Ospreys are seventh in the Pro12 table, nine points adrift of the play-off places, and Webb's imminent return from injury could put him in contention for Six Nations selection. 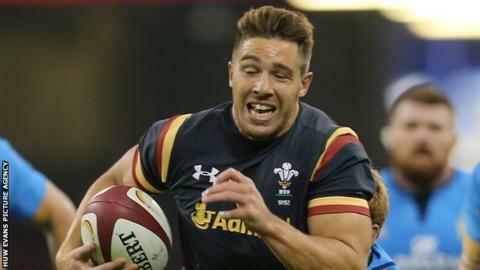 Wales have already selected three scrum-halves - Gareth Davies, Lloyd Williams and Aled Davies - so Webb, who has renewed his Wales and Ospreys dual contract, remains focused on his regional return. "I'm buzzing - it's like starting school again," he added. "It's been a long five months but over the last two or three weeks I've been ready. "I just need to touch up on a few extra skills and a bit of fitness. I feel really good, really sharp."